In this page you can find all about Short-term accommodation, Service Apartments, Room Rental. Oakwood Studios Singapore, the world’s first Oakwood Studios product targeting the millennial-minded, was awarded the Best Design Property in Asia Pacific. Oakwood Studios Singapore features 98 stylish apartments with tech-enabled spaces curated for guests to work, live and connect in. Each of the Studios, One- and Two-Bedroom apartments comes with a fully-equipped kitchen. Guests can access the rooftop pool, gym, BBQ and lounge. Centrally situated in the Orchard Road neighbourhood within walking distance to Orchard MRT station and access to a wide array of shopping, dining and entertainment options. Bask in style while taking in the city’s vivid sights during your stay with us, and capture new, unexpected experiences every time. Be spoilt for choice when it comes to selecting your ideal apartment. ST Residences are fully furnished, conveniently located at prime locations, and comes with a plethora of facilities for your indulgence. Bid farewell to boring cookie cutter apartments and settle into one of our homes away from home. Redefining the art of luxury island living, The Club at Capella Singapore is a serene tropical residence located just minutes away from the vibrant central business district of Singapore. Offering tenants a rare commodity in Singapore – the luxury of space, The Club at Capella Singapore presents the largest serviced residential accommodation in Singapore, with 62 sea-facing suites, ranging from one to four bedrooms, 10 two storey penthouses and nine standalone contemporary manors which start at 4,209 square feet, and feature their own private swimming pool. Each unit at The Club is fully equipped with luxuriously-appointed facilities including spacious walk-in wardrobes and top-of-the-range amenities; from fully equipped Miele kitchens and Bose home entertainment systems to Apple iPod docks and Sony 46-inch high definition flat screen televisions in living rooms and all bedrooms. Recline and bask in the breathtaking sunset views of the South China Sea or lush greenery after a day’s work in your dream home away from home. Come home to island living at its most refined at The Club at Capella Singapore. Along with a private Club Concierge who will attend to your every need and request, residents of The Club at Capella Singapore will enjoy preferential access to the exclusive facilities and services of the award-winning Capella Singapore. Comfortable, Convenient, and Cost-effective Serviced Studio Apartments in CBD. 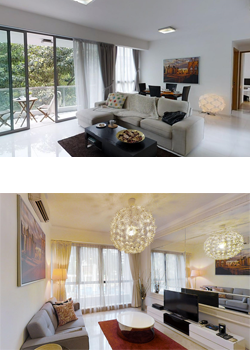 Located at the heart of Singapore, Triple 2 Studio on Cantonment Road is unrivalled in comfort, quality and location. Housed in a conserved corner pre-war building, Triple 2 Studio offers you a contemporary home within a heritage development built in the Art Deco style. You can choose from Deluxe Studio, Studio Suite and Grand Studio Suite, all which comes fully furnished with high-speed internet and en-suite with unrivalled service that entails concierge and housekeeping, a sense of home and nearby access to lifestyle hubs including 24 hours convenience stores and affordable local food options. The boutique property comes with a gorgeous rooftop deck with a view, multi-purpose room, gym equipment and a garden backyard. Providing round the clock surveillance systems and implementing automated-secured private access only to the building, your peace of mind is ensured. Triple 2 Studio will be your ideal abode in the City, suitable for leisure or corporate trip, or relocation to Singapore. To book, please check rates at www.tripletwostudio.com or check availability with sales@tripletwostudio.com and +65 62221772. Prime Location. Best Value. Attentive Service. As Singapore’s largest serviced apartment and hotel operator, we offer the widest selection of well-appointed quality residences that are strategically located in expatriate-friendly districts. Besides our stellar locations, what makes Far East Hospitality serviced residences the preferred brand for expatriates is our commitment to service excellence. More than just physical space, we offer far more value and give you peace of mind. We take pride in offering you our signature “home grown, world class” hospitality. LMB Housing Services is a pioneer in medium-term housing solutions in Singapore. 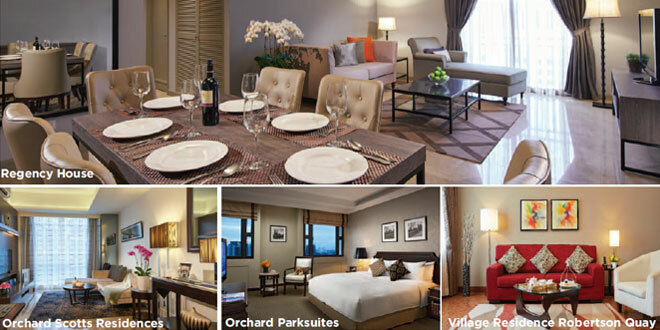 Our fully furnished and equipped serviced apartments cater to both Corporate and personal housing needs. 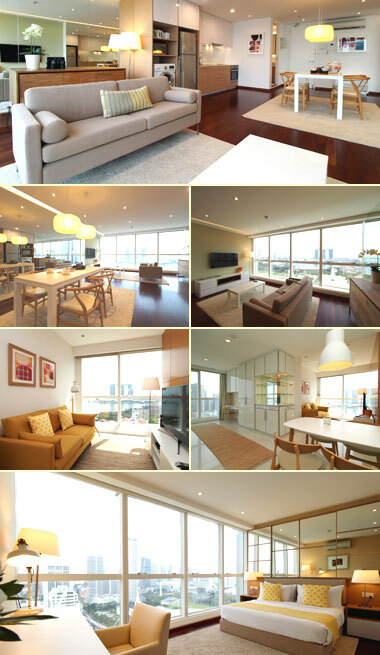 Our apartments are located in the central south/west of Singapore. All our apartments are situated at less than 10 minutes walking distance from the nearest MRT and offers a very easy commute to CBD in 15minutes. We also provide end-to-end customized Corporate serviced apartments to companies that need to accomodate large group of employees in their preferred location for a few months in Singapore. Located in the heart of Downtown Singapore, One North Bridge Apartments offer panoramic views of the Singapore River, the Parliament House, the luscious greenery of Fort Canning and the spectacular views of the Seafront. The Apartments are at the doorstep of Boat Quay/Clarke Quay and is well connected to an extensive network of public transport services, including numerous subway (MRT) lines. Our commitment to quality and service guarantees your satisfaction.